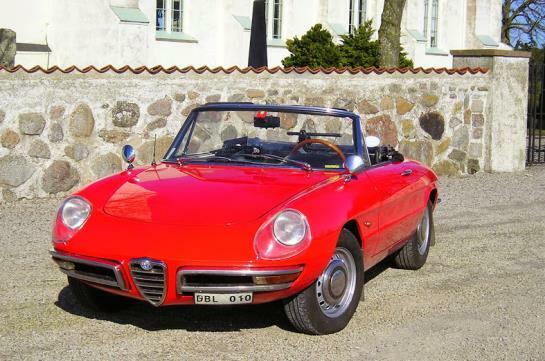 Welcome to the Alfa Romeo Duetto by Wille R.
Welcome to have a look at my Alfa Romeo Spider Veloce 1967. I'm from Sweden and have been Alfista since 1960. 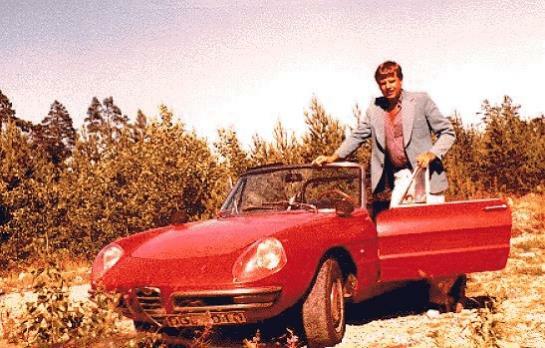 Today I am still love and enjoy my Alfa Romeo Duetto 1967 which I bought 1970 and I am still as thrilled as the first time. This is me and my Duetto 1970. One Alfista and two male Alfisti met three female Alfiste! The name "Graduate" was never used on the roundtails, but in the 1980's Alfa introduced a Spider model named Graduate. It was a stripped version of the 2000 Spider model with a Kamm-tail (square-tail). 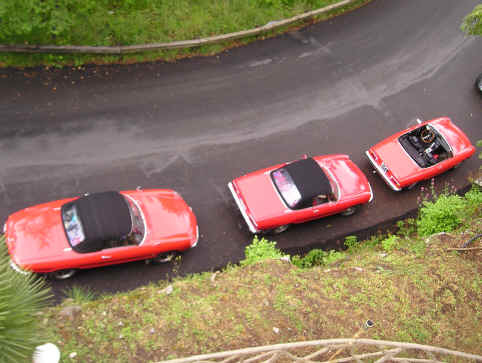 OurAlfa Romeo Duetto Spiders, lined up in Liguria, Italy. The original Spider Veloce is also named "Osso di Seppia" or Round-tail. Osso di Seppia means cuttle fish in Italian. If you have a Canary bird in a cage, you might have some "Osso di Seppia" there, it's the white chalk thing the bird uses to polish its beak on. The photo on my front page shows the beautiful Round-tail. People think that the rear end looks like that. Personally, I'm not that keen on the nick name. My Alfa Romeo is probably the oldest Spider Veloce still running and I have not yet located any Spider Veloce with a chassis number lower than mine. My car has "autoleaio" 119 which Luigi Fusi ranks as a 1967 in his excellent book Alfa Romeo Bible. The car is red of course, Rosso Farina, # AR514. This color has a slight tone of orange, which makes the red color a bit light. Very attractive, indeed. In the '60s, the 501 was very popular on Alfas. This color is however a bit more red than the Rosso Farina. In the Picture Gallery you may have a look at the different cars. If you send me a photo of your Alfa, I'll add it to my gallery. If you have a Spider Veloce or a Duetto, please register model, year and chassis number, graze. This will give you full access to my Spider register and the opportunity to contact the owners yourself. I am trying to locate the remaining Spiders from the good years, when cars were cars with carburetors, Buddy Holly and Jerry Lee Lewis were the artists and girls were girls! Know what I mean? How about that, wish you had a Duetto, eh?